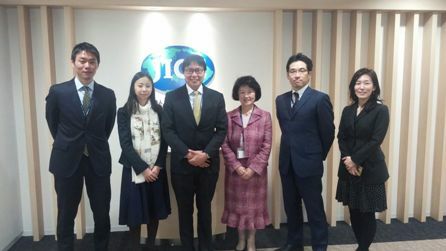 Ms. Sachiko Yamano, President of JICE received a visit of Dr. Naranbayar Purevsuren, Principal of Shine Mongol School on March 22, 2016. The meeting began with Ms. Yamano talking about the history of Japan’s cooperation to Mongolia. Dr. Naranbayar mentioned that 37 graduates of his school entering Japanese universities this April were undergoing orientation program in Miyagi and Chiba Prefectures. Dr. Naranbayar also referred to the current situation of Mongolia achieving the rapid economic growth backed by full-fledged development of the mining sector, and mentioned that quality education is essential to design a path of Mongolia’s future and to empower young generations who will lead the nation’s right development. To that end, he said that the Japanese history has a number of good practices for Mongolia such as the Meiji Restoration. In conclusion, both sides reaffirmed their commitment to strengthen the relationship between the two countries. Shine Mongol Academy is a private educational institute which currently consists of integrated primary-secondary school, technical college and university. At the beginning, its high school was established in Ulaanbaatar, the capital of Mongolia in 2000 with the support from Japanese volunteers. The school applies a number of Japanese methods in education such as curriculum, school meal system and sport clubs activities. They focus on Japanese language training for their students. Many of graduates study abroad in Japan, the US, China, etc. This year, two graduates working in the government of Mongolia were selected by JICE-administered Project for Human Resource Development Scholarship (JDS).